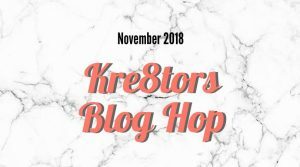 Welcome to the November Kre8tors Blog Hop. Whether you have joined me from Linda or just started this Blog Hop with me, you are sure to find some lovely projects. 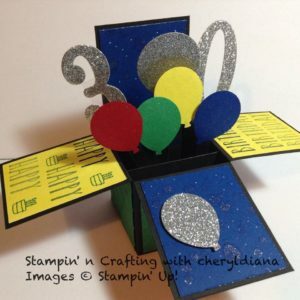 This month our theme is Birthdays which is quite appropriate as my stepson recently had his 30th Birthday. So I needed to make a special card for him. I decided to make a box card. I made the base of the card using Basic Black card stock as I wanted to use some of our 2018-2020 in color card stock. Once I had made the base of the card I started to decorate it using Blueberry Bushel, Call me Clover, Real Red and Daffodil Delight card stock. 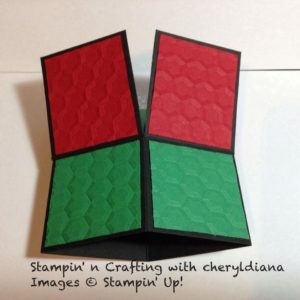 I embossed the Real Red and Call me Clover card stock with the Hexagon embossing folder and stuck these onto the bottom sides. Next I decorated the top of the card. Unfortunately the Number dies are now retired but are just the right size for this type of card. I punched out balloons using the Balloon Bouquet punch and then went over them with Wink of Stella Glitter Brush to give them a shimmer look. I then decorated the Daffodil Delight and Blueberry Bushel card stock. For the Blueberry Bushel sides I flicked Wink of Stella onto them using both the normal brush and the watered down with rubbing alcohol to give a starry night look. For the Daffodil Delight sides I stamped Happy Birthday from the Perennial Birthday stamp set and the little cake from Tabs for Everything stamp set. Finally I punched out 2 balloons using the silver glimmer paper and stuck them onto the card. I hope you have enjoyed seeing my project. Please do leave comments as you hop around the blog hop. Please click on the NEXT button to hop over to Anastasia and she what she has produced using these colours. Oh I always love cards with a special effect, moveing parts or things like that. Your card is no exception. I love the bright colors and the happiness it spreads! What a fabulous fun card – I’m sure your stepson will love it! How fun! I love that you made a box card! The colors are awesome and I think your step son will love it! Thank you so much for sharing your fun project with us! So glad you are part of our hop to share your inspiring ideas! 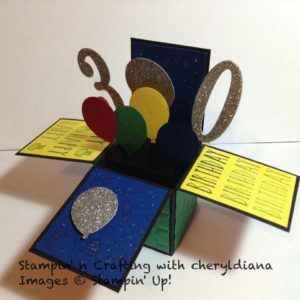 What a festive box card, love your choice of In Colors! Love your box card, I recently made one myself for the first time, very impressive. Super fun – I love your balloons in this design. You made a party in a box! I love the happy bold colours! Thanks for sharing! Wonderful fold! I love box cards! I may have to case this for a friend’s 50th birthday! What a fantastic birthday box!! !